Ryan Moore, Kieran Fallon, Richard Hughes and Silvestre Da Souza head the betting market for the 2012 Flat Jockey Championship all available to back around the 4/1 mark. Defending champion, Paul Hanagan, is also in the mix and is a best price 7/1 to win the title for a third successive year but is as short as 7/2 with Bet365. With Ryan Moore back in the saddle after injury ruled him out of proceedings last season, he will be hoping that the Sir Michael Stoute stable has a much better time of things this season than he did in 2011 after saddling only 47 winners. 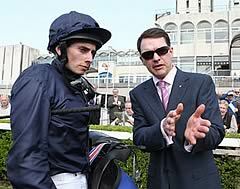 Moore will also be taking a number of top rides for Aidan O’Brien which can only help his case but being widely regarded as the best around currently, Moore can guarantee as many rides as he wants. He finished leading jockey in 2006, 2008 and 2009 and it would be no surprise to see him bid to regain that honour in 2012. Kieran Fallon will also be looking to regain the title he last won in 2003, which at the time, gave him his sixth championship in seven years. After his much publicised troubles, Fallon returned to riding last season and acquitted himself extremely well considering he is no longer the first choice jockey for a leading stable. A total of 145 winners from just over 900 rides gave him a strike rate of 16% and one that he is sure to improve upon this year. Silvestre De Sousa challenged Hanagan all the way last season but had to settle for second place with 161 winners, four behind Hanagan. The case for De Sousa going one better this season can only have been helped after being appointed Godolphin's number two jockey behind Dettori, however, it could also have an adverse affect should it mean him missing better rides for other trainers. Notwithstanding, the Brazilian has proved himself as a very capable jockey and has certainly a bright future in horse racing. Hanagan may also have a similar problem to De Sousa in that he has been appointed as the retaining jockey to Sheikh Mohammed following the retirement of Richard Hills. Hanagan rode the vast majority of the 109 winners from the top Northern stable of Richard Fahey stable last year and although Fahey has pledged to continue using him when he is not elsewhere engaged, the fact that Hanagan will base himself in Newmarket could reduce his options for the Yorkshire trainer. For many, the sensible bet in the 2012 Flat Jockey Championship is Richard Hughes, the stable jockey to last year’s top trainer, Richard Hannon. He finished only 35 winners behind Hanagan last year but had over 400 hundred fewer rides, with much of that due to him riding plenty of weekends away from the country. Should Hughes take on the commitment he made in 2010 when he finished just 13 behind he could well feature very prominently and land the title for the first time. Others who must enter the reckoning include Jamie Spencer and Seb Sanders, who shared the title between them in 2007. Sanders has struggled the last couple of years following a broken leg but should be back full time in the saddle this year and raring to go and could prove a massive price with Sportingbet at 150/1 when other firms make him a 50/1 chance. Spencer meanwhile has gone on record as saying that he is looking to increase his riding activity this year and if he is true to his word, then he is always a jockey to follow, he rode 100 winners last year from just over 600 rides and is a 25/1 shot for the title. Other Outsiders include William Buick, first jockey to John Gosden and Tom Queally who will be riding as lead jockey to Sir Henry Cecil whose stable is back to full capacity with 140 runners this year. Buick is around the 14/1 mark while Queally is one for each way backers at 40/1. The race for the 2012 Flat Jockeys Title begins at Doncaster this week.